Around November [and into December] the gardening round always throws up the question, ‘Would you like me to leave the seedheads or cut them down’? I always ask as it’s a personal preference…and it is their garden…and I always hope that maybe one day they will actually surprise me and all say, ‘leave them’. More often than not I am cutting them down [Achillea, Anenome, Echinacea, Iris, Phlox, Rudbeckia, Salvia etc etc] and squeezing them into green wheelie bins, ladybirds and all. Feeling slightly guilty, I wait for these creatures to climb to the top of the stems, pick them off and attempt to find them a new home in the now naked garden. 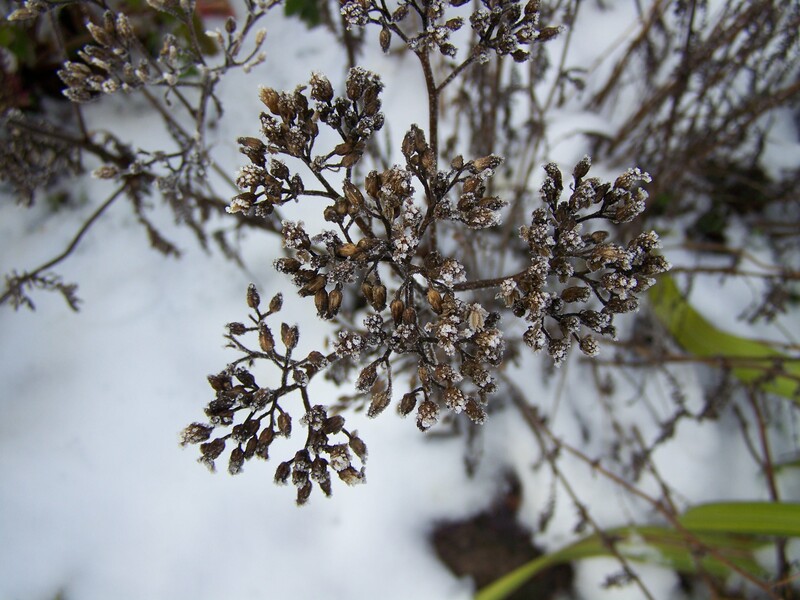 It is true what they say; leaving dead stems will provide homes for insects [beneficial as well as the pests] to hibernate through the winter and is one horticultural ‘good practice’ reason not to do the chop. Another reason to leave them is for their structural contribution to the winter garden. 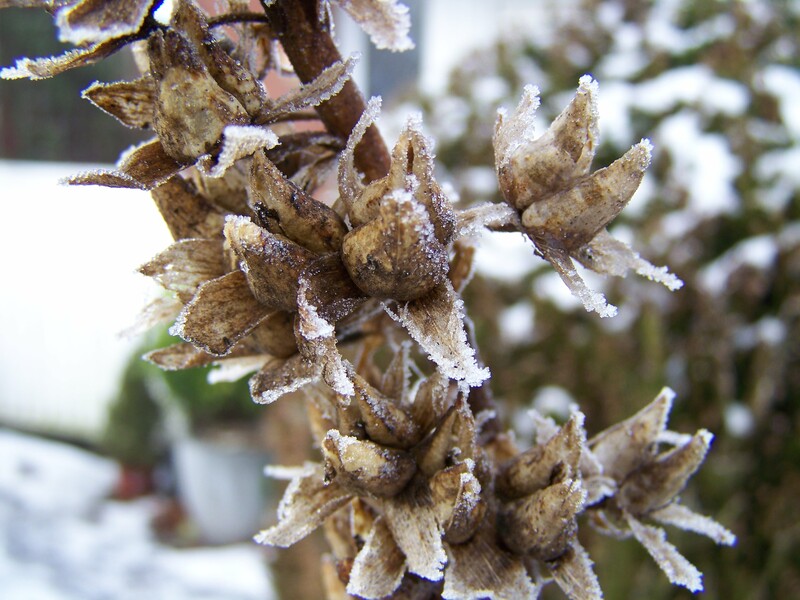 No one can deny how interesting dead stems can look after a hard frosty night, all icy and crystallized. I am a huge fan of this transformation and is my excuse for being ultimately lazy and not lifting a finger in my own garden till the spring. However, not all plant specimens are good for this purpose. Many perennials and grasses disappointingly flop, strew themselves all over the ground and look a complete mangled hash. Molinia caerulea subsp. arundinacea ‘Transparent’ starts off by showing such wonderful promise. Tall, elegant, fawn-coloured stems gleam in the border, but then, overnight they flop. Drat. I have two of these grasses in the garden and so wish I’d gone for a sturdier Miscanthus instead. With clients who don’t mind what I do with their stems, I always go with the ‘flop chop’ approach. All the sturdy stems I like stay and the flopped ones I don’t are cleared away. I’m happy, the bugs are happy, the client’s not really bothered. The ‘leave or not to leave’ preference has even impacted on my planting design plans, particularly perennial and grass based schemes. All clients want low maintenance as well as year round colour and interest in their borders. 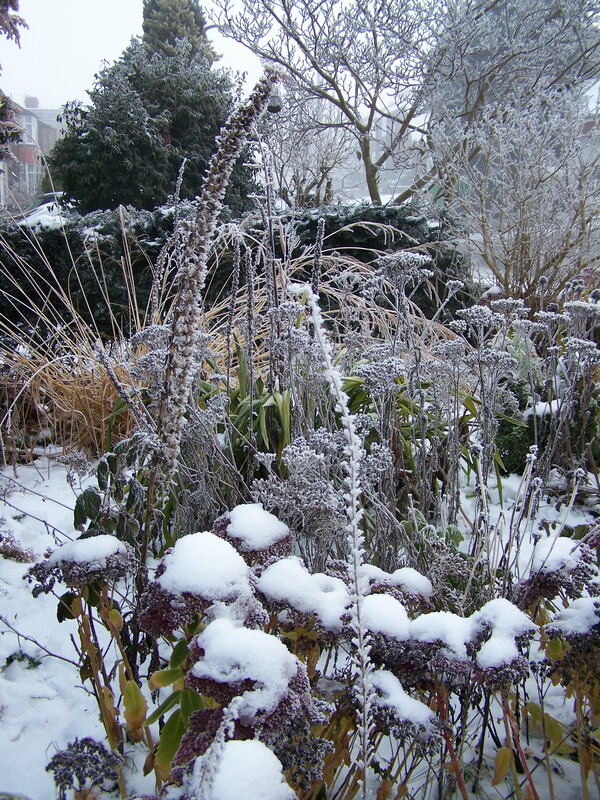 Choosing plants that keep their structure well into winter is an important consideration and one that I have been making mental notes about over recent years. Some favourites for keeping upright and strong stemmed are the umbels of Sedum and Achillea millefolium [‘Terracotta’ holds really well], the tiny spherical seedheads of Anenome, the spires of Digitalis and Verbascum, the whorls of Phlomis and the shorter billowy grasses Hakonechloa and Stipa tenuissima. Miscanthus, as mentioned already, is great for winter plume structure, Eupatorium maculatum for big perennial umbel structure and Ligularia japonica for fluffy seedheads that will be blown away in the winds. There are loads of suitable candidates out there, it’s just a matter of bearing in mind what happens to them after they have performed for the summer/autumn months…do they flop or not? The main reasons for leaving them be in my own garden [above], are, in order of importance: first has to be ease of maintenance [laziness], second structure [I don’t usually do the ‘flop chop’ approach here either], third hibernating bugs, fourth I’d like to say annoy the neighbours, but they probably don’t give a monkeys about how my front garden looks and fifth because as soon as I sniff that lovely warming earthy smell of spring I can get out there and clear away the cobwebs till my hearts content. So what kind of person are you, to leave or not to leave?